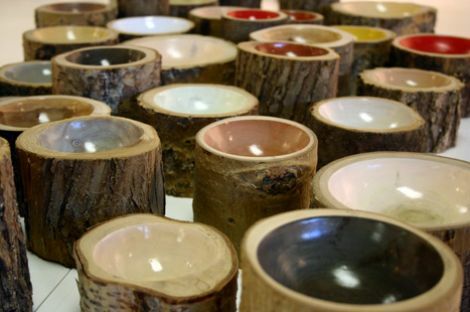 these little log bowls from canadian artist doha chebib are so delightful. 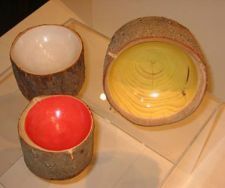 the simple lathe-turned pieces are reminiscent of basic woodworking, and the material naturallyÂ prompts quixotic thoughts ofÂ the canadian wilderness. 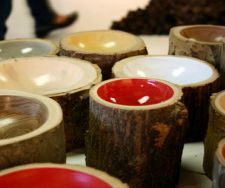 they are finished with an acrylic stain, and of course no two are alike. doha is a member of the loyal lootÂ collective, a smallish group that features theÂ design work of canadian women, both collaboratively and singly, in a variety of media. theyÂ strive to create designs with an honest, organicÂ quality to them, soÂ that the end user willÂ derive increasing amounts of sentiment and meaningÂ as time passes.